Kyle White likes the charm of the South, specifically the small town of Poplarville, Mississippi- just a stone's throw away from the University of Southern Mississippi, where he attended. I think it's fair to say he got a good education. 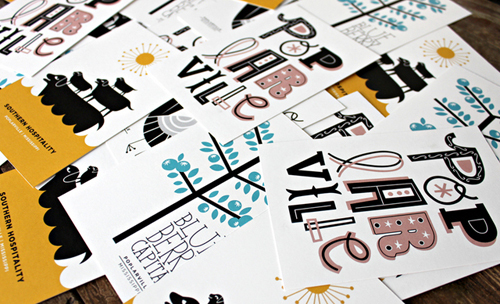 Kyle designed these postcard sets for the city of Poplarville and has accrued an impressive portfolio over the years, now living and working in New York City as a graphic designer. Kyle shares that "these postcards were intended to reflect the town's relaxed atmosphere and landscape." Poplarville is not very populated. With just over 2600 residents, it has small town appeal. It certainly left a mark on Kyle, now it leaves a mark on us.